Worn or loose steering bearings may cause danger. Therefore, the operation of the steering must be checked as follows at the intervals specified in the periodic maintenance and lubrication chart. 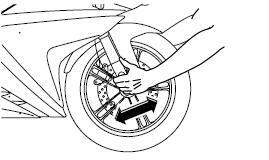 Place a stand under the engine to raise the front wheel off the ground. WARNING! To avoid injury, securely support the vehicle so there is no danger of it falling over. Hold the lower ends of the front fork legs and try to move them forward and backward. If any free play can be felt, have a Yamaha dealer check or repair the steering.